For everyone living in Melbourne, you may well be aware of this already, but just in case, i thought i would mention the fact that Banksy’s movie, Exit Through the Gift Shop, is coming to town. As well as being a fascinating account of hype and marketing in the world of street art, it also contains some amazing footage of street art (and street artists in action) around the world – including several shots of the work of local artists such as Rone, Ash Keating and Vexta. If you are living in Sydney, the movie is screening at the Sydney Film Festival on 2nd and 7th of June, but according to their website, the sessions are already sold out…. I’ve written previously about the movie – I saw it in April in New York and posted a two-part review of the film (here and here). I won’t repeat what I’ve already written about the film; you can check out those posts if you’re interested in my views on the movie. In the interests of full disclosure, in the wake of the recent online debates about the differences, if any, between blogging and marketing, I should mention that Madman, who are distributing the movie in Australia, invited me to mention it on this blog. I’m not being paid to do so, and I wouldn’t make any mention of it if I thought the film was rubbish. It’s not rubbish, it’s well worth seeing, so I am happy to mention it here. But in recent weeks there’s been a groundswell of awareness about the potential of blogs to influence consumption and opinion – the most acute version of this occurred in New York last month, and you can read here a thoughtful account of the implications of the way the Banksy film was promoted in the United States. I don’t imagine that my opinions in this blog will exercise much influence at all over whether or not you go and see Exit Through the Gift Shop, but it’s only fair to mention the fact that I am also appearing on the panel discussing art, advertising and public space after the movie screening at ACMI on Sunday 6th June, and that the Friday 4th June screening of the movie is timed to facilitate your attendance afterwards, should you be interested, at a book launch taking place at Federation Square in the Atrium at 7pm – and that book is Street/Studio; the Place of Street Art in Melbourne (and I am a co-author of that book). More about the book soon! So that’s the background to this post. Is the film worth seeing? Even if you have no interest in street art per se, it’s still a fascinating documentary, with a great film-within-a-film narrative. And if you are already interested in street art in general (or Banksy in particular), then it’s essential viewing. Funny, inspiring, provocative – it probably raises more questions than it answers, and it’ll produce endless hours of conversation about Banksy himself, about Shepard Fairey, Invader, and – more than anyone – about Thierry Guetta. Who? See the film, and find out. 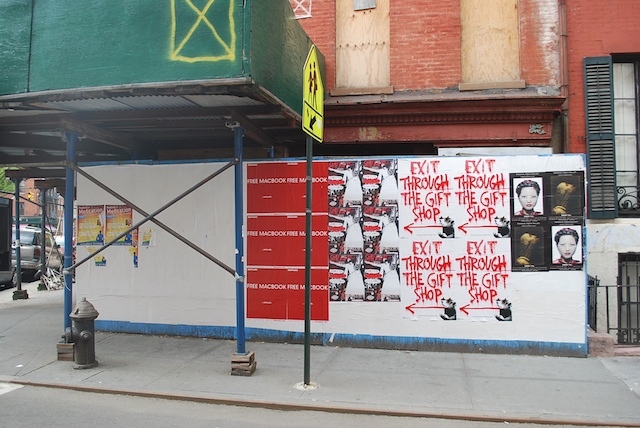 In the above photo you can see posters advertising Banksy’s movie, Exit Through the Gift Shop, on a hoarding in SoHo in New York. A brief post on Vandalog recently sparked an interesting conversation in the thread of comments – around the vexed qurelationship between street art and advertising. Comments in response to this were sharply divided between those who basically agreed with the point he made, a second group who interpreted Vandalog’s comments as unfounded criticism of their fave street artist, and a third group who thought that since the main objective was to get people to see a thoroughly worthwhile movie then bill posting was an effective way to inform people (especially people who might not be plugged in to networks and blogs within the street art community) about the movie. But bill posting – well, that’s often seen as something different, something done by clothing companies and by music promoters. Agencies pay bill posters to wheatpaste flyers around a city – an activity often done late at night because it is usually illegal. A number of years ago, the City of Westminster, one of the London municipal authorities, decided to crack down on fly posting as it’s called in the UK, issuing fines to the companies whose wares were being advertised rather than to the fly posters and the advertising agencies (not much came of this, and there’s as much fly posting in London as ever). 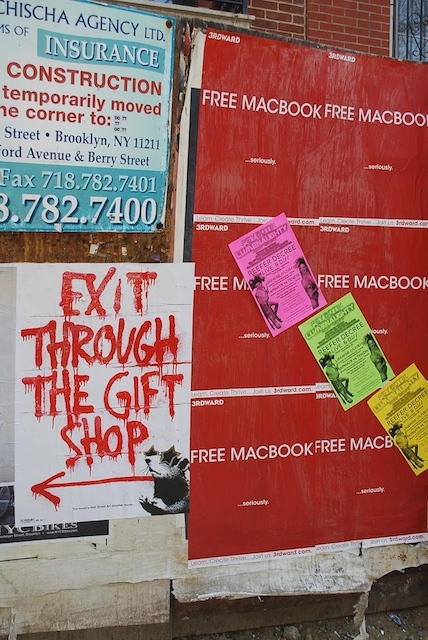 Anyway, Vandalog asked why use bill posting to advertise Exit Through the Gift Shop rather than something more directly related to street art, like stencils (or indeed, why not stickers?). Asking such a question assumes that bill posting is different from street art. It’s worth thinking this through: what, if anything, makes bill posting different from street art? I think it’s complicated. Bill posting involves putting material into public space, usually without the permission of the owner of the property it’s placed on. It’s usually as illegal as street art. In 2008, when the Tate Modern ran a series of talks on street art, the curator, Cedar Lewisohn prompted discussion around exactly this issue by inviting former fly poster Mustafa Hulusi (who is now an artist who sometimes puts images on billboard spaces – click on the link and then on ‘Posters’ and then on ‘2007’ for some examples) to speak along with Brad Downey on art and the politics of public space. And that confirms that these are not aesthetic interventions in public space, however appealing the poster is. They weren’t put up by Banksy’s assistants or anyone connected with him; they must have been put up – I’m guessing – by the standard bill posters who work in the illicit economy putting up posters for anything, just pasting up whatever they are given. And in another fascinating development, Vandalog published news today that some of these posters have in fact been gone over by Jordan Seiler of Public Ad Campaign (click the link for photos and for Jordan’s essay on this issue), replacing ads with street art…. Given the intense interest in Banksy as an artist and in the mystery of his identity, it’s inevitable that this film will attract a lot of attention. What’s as interesting as the movie itself is the range of responses that people are having to the film. Among those who’ve seen it so far, people speak positively of the film (as they should, since it’s a highly enjoyable documentary), but they also seem, first of all, surprised that it is more about Mr Brainwash (aka MBW aka Thierry Guetta) than it is about Banksy; and, second, disappointed that, because the film is more about Mr Brainwash, Banksy doesn’t reveal much of himself in the movie. Let’s start with the first of those reactions, that the film’s not ‘about’ Banksy, which certainly raises the question of what the film is about. Well, the film operates on many different levels, and one of its main ones is the story of how street art took off, from being something with an intense local significance which was shared through the networks of the global street art community for the enjoyment of those who practice or appreciate street art, to became an entrenched part of the mainstream art world, whereby paintings (and artists) are commodified for profit. To tell that story, the film focuses on Thierry Guetta’s transformation from amateur film-maker into artworld succes du jour, as a means of demonstrating both the possibilities open to anyone with the will to put up art and the (slightly frightening) logical consequences of those possibilities (for example, having people queueing for hours to get into your art show, simply because they’ve been told by the media that your art is important). The film treads a clever and careful line between condoning and critiquing the commercialization of street art, as its embodied in Guetta’s transformation: it really is left up to the viewer to work out where you stand on the issue. In some ways, the film seems to be criticizing the people who have bought Mr Brainwash’s work for vast sums of money and who have contributed to his art world stardom, but, then again, isn’t this the same art world that has made stars of Shepard Fairey and Banksy and Blek le Rat? If we want to critique the art world, it must be a critique that can specify why Mr Brainwash’s stardom is problematic when that of the others is not. So: how do we think through that problem? Is it because Mr Brainwash doesn’t make all of his art himself? Neither does Shepard Fairey nowadays, nor Banksy (both of whom have assistants – and we see some of Banksy’s assistants at work in the film), and neither does Jeff Koons, for that matter. Is it because Mr Brainwash’s work is derivative (his work repeats many of the devices used by Andy Warhol, Banksy, Fairey, Nick Walker, Blek…)? Well, that might be a better founded criticism, but it still requires us to think through its implications: each of those artists borrow from other artists and art movements, re-presenting certain tropes in order to create a new art idiom. Perhaps Mr Brainwash’s endless borrowing (what some would even call plagiarism) from the borrowers lacks aesthetic merit because it does nothing new – no new idiom emerges from his pillaging of pop culture and street art. At any rate, I think these issues form the heart of what the film is about – and I’d back this up by referring you to the movie’s title. By calling his film ‘Exit Through the Gift Shop‘, Banksy is both having a sly dig at museum culture, which often cynically seeks to extract more money from visitors after they have viewed an exhibit, but he is also pointing out to us the direction that street art may be heading in, now that its commercialization is so advanced – the only ‘exit’ is to find a way through the endless consumption offered to us as a poor substitute for the art itself.